Lewis Hamilton has taken pole position for the Chinese Grand Prix, his third pole out of three races in this year’s Formula One world championship so far. Hamilton, who set the fastest times in all three practice sessions in the build-up to qualifying, beat his team-mate Rosberg to pole position by just 4 hundredths of a second, with Nico throwing everything he had at Lewis to try and displace him. Malaysian Grand Prix winner Sebastian Vettel took 3rd on the grid, with Ferrari still looking like the closest challengers to Mercedes. Hamilton has now had pole position for the Chinese Grand Prix at Shanghai 5 times. This means he joins a list of just 3 other drivers who have had 5 or more pole positions at single track. The list also includes Michael Schumacher, Juan Manuel Fangio and Ayrton Senna. 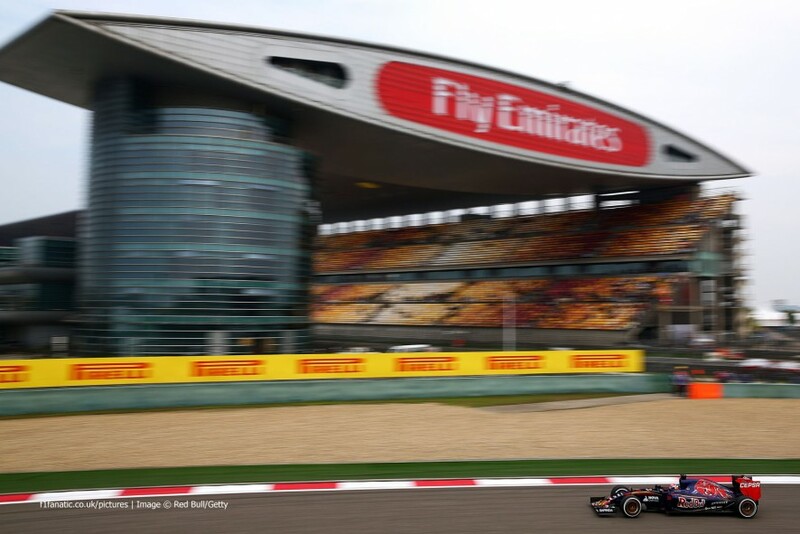 Unusually clear and sunny conditions greeted the drivers at the Shanghai International Circuit as qualifying for the 3rd round of the season got under-way. As predicted from practice performance, the two Mercedes drivers were comfortably quickest on the medium compound tyre. This mean that they were able to complete just one run on the slower tyre to advance through to the second session. The rest of the field opted for a run on the faster, soft compound. The Ferrari pairing of Sebastian Vettel and Kimi Raikkonen were among the fastest on the soft tyre, with Bottas’ Williams and Grosjean’s Lotus also showing good pace. Despite this, Hamilton and Rosberg were able to hold on to 5th and 8th respectively. 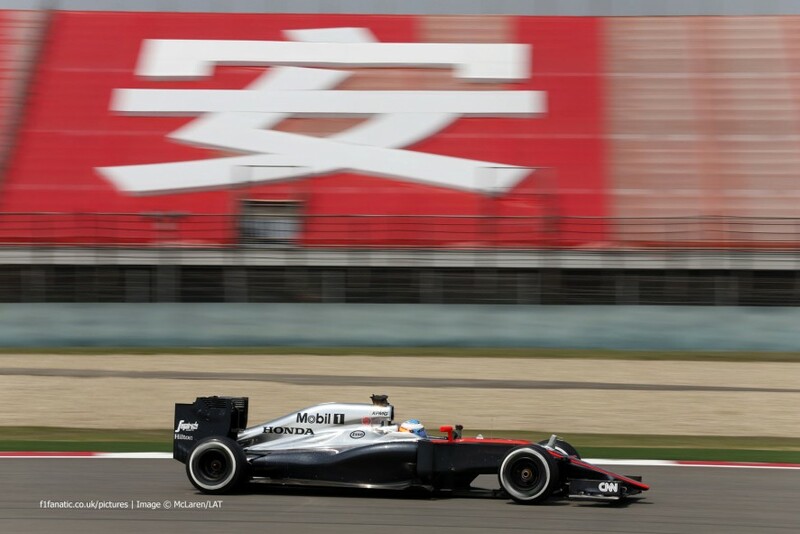 McLaren had been targeting their first Q2 appearance of the year in Shanghai after showing reasonable pace in practice. This wasn’t to be however, with both Button and Alonso missing out by two tenths of a second. Alonso had bounced back after an engine issue in final practice to get 18th on the grid; a few thousandths slower than team-mate Button in 17th. The Honda-powered pair were joined in elimination by Hulkenberg in 16th and the two Manor cars in 19th and 20th. Both Will Stevens and Roberto Merhi were well inside the 107% limit and will race tomorrow. Hamilton continued to hint that he would be the one on pole position, as he hit the top of the time-sheets in Q2 with a 3 tenth advantage over his team-mate. Hamilton had been complaining of a hot seat in his car, a problem that had plagued him in practice. The two Ferrari drivers maintained their positions as the closest challengers, with Vettel within half a second of Hamilton in first place. The margin between making it into the top 10 shoot-out and being eliminated was very small. Pastor Maldonado missed out on joining his team-mate by just a few thousandths of a second; with Marcus Ericsson clinging onto the final position in the top 10. Daniil Kvyat similarly missed out by a small amount, with the Red Bull driver missing the cut by a tenth of a second having abandoned his first run in the session due to a loss of power. Toro Rosso wouldn’t have any representation in the final session for the first time this season, with both Max Verstappen and Carlos Sainz losing time throughout the lap. They still out-qualified the Force India of Sergio Perez, who will line-up 15th on the grid for tomorrow’s race. Hamilton led the time-sheets early on in the top 10 shoot-out after his first run which would later turn out to have been enough for pole position. He emerged straight out of the blocks to set the fastest time of the weekend so far, a 1’35.782. 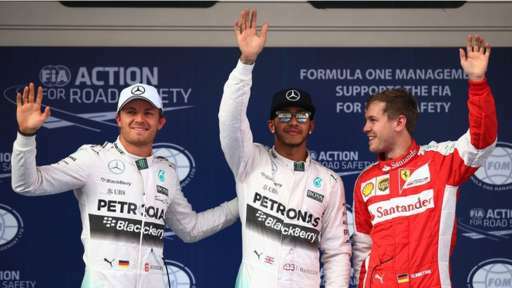 Nico Rosberg followed soon after but once again was down by a few tenths on his team-mate. Nico Rosberg wasn’t done yet however. On his final run, Rosberg’s last lap didn’t look like anything special according to his times in the first and second sectors, but a very impressive final sector allowed the German to get tantalisingly close to beating his team-mate. It was not to be however, with Nico missing out by just 4 hundredths of a second. Nico, understandably for a racing driver, was not happy with second place it seemed after a frustrated tone on the team radio followed by a handshake for Vettel and nothing for his team-mate; who joins an elite group of drivers who have taken 5 or more pole positions at a single track. His 5th pole at Shanghai see’s him on the list with Ayrton Senna, Juan Manuel Fangio and Michael Schumacher. Third place would belong to Vettel in the Ferrari. The German showed that Ferrari had a reasonable pace, but his team-mate Raikkonen was unable to join him on the second row of the grid as he settled for 6th. If their race pace from Malaysia and their long-run times in practice are anything to go by however, the Scuderia pair could still put up a fight with the Mercedes tomorrow. The two Williams drivers were sandwiched in between their rivals at Ferrari, with former Ferrari driver Felipe Massa out-qualifying team-mate Bottas by 2 tenths. Behind Raikkonen in 6th was the Red Bull of Daniel Ricciardo, who seemed a little happier with his car after the switch back to Brembo brakes following issues in the Malaysian Grand Prix two weeks ago. Romain Grosjean took 8th on the grid for the #8 car, with the Frenchman targeting the first points of the year for Lotus tomorrow. He beat the Sauber pair by over a tenth, with Felipe Nasr and Marcus Ericsson propping up the top 10 after the team impressively got both cars into the final session for the second time this year.